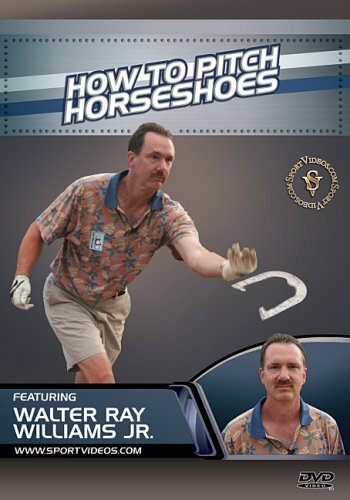 SportVideos.com :: Half Price DVD Sale :: Horseshoes DVDs :: How to Pitch Horseshoes DVD with Coach Walter Ray Williams Jr.
Home :: Half Price DVD Sale :: Horseshoes DVDs :: How to Pitch Horseshoes DVD with Coach Walter Ray Williams Jr. Legendary horseshoe pitching champion Walter Ray Williams, Jr. explains every aspect of this fun and challenging sport. He works with players of various skill levels, and provides them with all the techniques, tips and strategies needed to become better players. Walter Ray also details various scoring methods and rules used when competing in league play and tournament matches. This comprehensive DVD is a must-have for anyone serious about pitching horseshoes! About the Coach: Walter Ray Williams Jr. is a nine-time World Champion in horseshoes (three junior titles and six men's titles). He is a member of the National Horseshoe Pitching Association Hall of Fame and has won many other titles in the sport. He is also a champion Pro Bowler and is currently the leading money winner of all time on the Pro Bowler's Tour.